PBA Finals News 2018: Magnolia Hotshots won anew over the Alaska Aces, 77-71 to take a commanding 2-0 lead in Game 2 of their Finals series in the 2018 PBA Governors’ Cup this Friday at the Araneta Coliseum. Jio Jalalon converted the Hotshots’ last six points in crunchtime to secure the Magnolia victory. Jalalon finished with 7 points and 7 rebounds, while import Romeo Travis led with 24 buckets and 9 boards. ➤ Post operator Ian Sangalang also contributed 11 points and 5 rebounds for Magnolia, while ace guard Paul Lee made 8 points and 4 rebounds. ➤ Magnolia secured the game with impeccable defense over the Aces, causing 26 turnovers to Alaska courtesy of 20 total steals. The Hotshots also moved the ball better, dishing out 19 assists compared to the Aces 17 total. ➤ Reinforcement Mike Harris paced the Aces with 22 points and 13 caroms, while “muscle man” Vic Manuel had 10 points and 5 rebounds. ➤ Game 3 will be at the Ynares Center in Antipolo this Sunday, December 9. Quarters: 20-22, 36-41, 61-65, 77-71. Travis 24, Sangalang 11, Lee 8, Dela Rosa 7, Jalalon 7, Reavis 6, Melton 5, Simon 4, Brondial 3, Barroca 2, Pascual 0, Herndon 0. Harris 22, Manuel 10, Banchero 9, Racal 7, Enciso 6, Casio 5, Exciminiano 4, Teng 4, Cruz 2, Thoss 2, Galliguez 0, Baclao 0, Pascual 0. PBA News 2018: Magnolia Hotshots entered the Semifinals, as they knocked out the Blackwater Elite, 103-99 in the 2018 PBA Governors’ Cup quarterfinals this Tuesday at the Araneta Coliseum. “Angas ng Tondo” Paul Lee backstopped the Hotshots with his double-double of 22 buckets and 12 boards, while import Romeo Travis and post operator Ian Sangalang 18 each respectively. ➤ Magnolia outrebounded and outpaced the Elite with 59 rebounds against 50, and registering better ball movement with 29 assists to 16. The Hotshots also shot better with 37 of 90 field goal shots (41%) to Elite’s 34 of 83 (40%). ➤ Reinforcement Henry Walker led the eliminated Blackwater with 18 points, as Poy Erram also contributed 15 buckets. 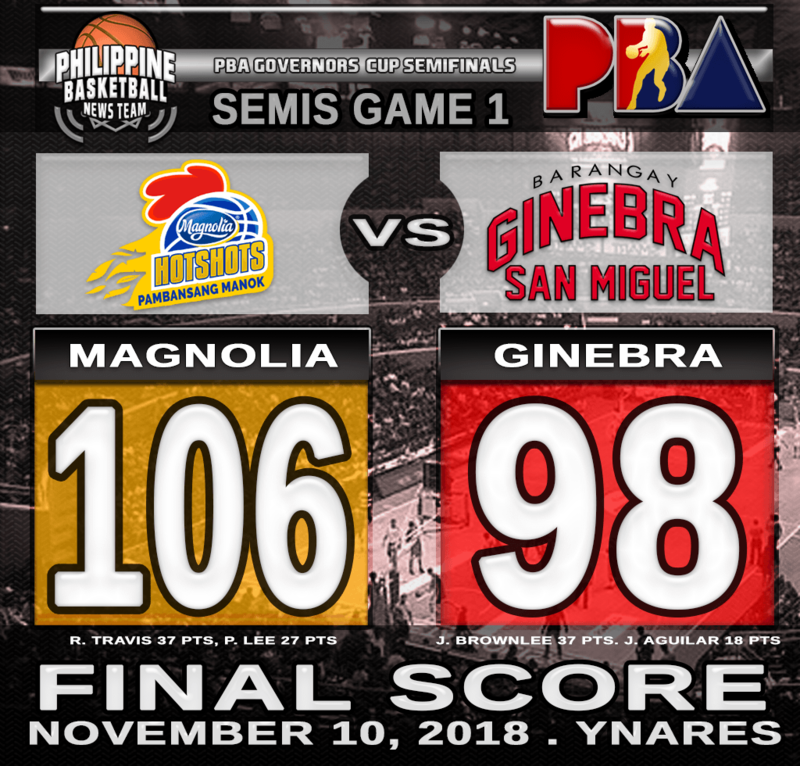 ➤ Magnolia will next battle with league-leader Barangay Ginebra, the defending champion, who also gained the Semis berth after routing earlier the NLEX Road Warriors, 111-75. Quarters: 32-22, 55-47, 76-78, 103-99. Lee 22, Travis 18, Sangalang 18, Simon 16, Barroca 9, Melton 8, Brondial 4, Dela Rosa 3, Reavis 3, Jalalon 2. Walker 18, Erram 15, Zamar 13, Maliksi 12, Belo 11, Digregorio 8, Sumang 7, Pinto 7, Javier 4, Al-Hussaini 4, Jose 0. PBA News 2018: Magnolia Hotshots secured the top-seed as it cracked Talk ‘N Text KaTropa, 116-103, in the 2018 PBA Governors’ Cup this Friday at the Ynares Center in Antipolo. Low-post operator Ian Sangalang paced the Hotshots with his 28 markers and 6 boards while Mark Barroca chipped-in 21 points. ➤ Ace guard Paul Lee also added 19 points, 8 dimes and 8 caroms for Magnolia, while import Romeo Travis made 18 buckets. ➤ Magnolia outmuscled TNT in the paint as they hauled 62 rebounds against TNT’s 38, and also shot better from the trey territory making 11 of 24 (45%) three points to KaTropa’s 12 of 35 (34%). ➤ Terrence Romeo starred for the losing KaTropa as he dropped 23 markers, while Troy Rosario contributed 21 points. Reinforcement and former Hotshots import Marcus Blakely had a triple-double as he registered 17 goals, 18 rebounds, and 11 dishes. ➤ National mainstay Jayson Castro who returned from bone spurs foot injury managed to add 13 points for Talk ‘N Text. ➤ League leader Magnolia (8-2) just booked a twice-to-beat advantage as they enter the conference quarterfinals. Meanwhile, TNT who dropped to 4-6, is now in a must-win situation as they battle Ginebra on Sunday, November 4 for a possible entry into Governors’ Cup quarterfinals. Quarters: 33-30, 62-48, 89-78, 116-103. Sangalang 28, Barroca 21, Lee 19, Travis 18, Jalalon 9, Melton 9, Reavis 4, Brondial 4, Herndon 2, Dela Rosa 2. Romeo 23, Rosario 21, Blakely 17, Castro 13, Cruz 8, Trollano 7, Pogoy 6, Williams 4, Carey 4, Reyes 0, Garcia 0, Golla 0.